I will find a way to simplify them! I haven't really thought much about the Hermit, Tower, or Devil. I had some ideas initially for Tower and Devil, but I think they're pretty unsubstantial. But dreaming up these images is part of the fun! I DO think Devil will be fun, because I always like to think that he's never overtly "the devil". Have you seen the movie Constantine? I love the way the Devil is portrayed there. i haven't. the devil can be a slippery card... it can be read in so many ways. rws makes it look so scary... most people don't really like the tower, but although it looks scary, i always welcome it in my readings. i think the most important part (other than the tower, of course) is the lightning. i'm excited to see whichever card you finish next! I actually don't know yet! I've only got ideas for maybe.... 1/3 of the cards? But even those are subject to change, since I'll be consulting with a professional reader to make sure that the symbolism and content is correct. Buuut, if I HAD to answer, I would say I have high hopes for The Magician and Death. Those are my favorites cards too! Although I'm curious to see what The Lovers an Justice will look like. I've so far felt that the Major Arcana are the "big guys" of the deck, so admittedly I'm a little scared to get started on them! With that said, I'm shooting photography reference for Strength and Moon this weekend, so I'll have to start painting those fairly soon. I have a very concrete idea in my mind for Lovers, and I'm super excited for that one! 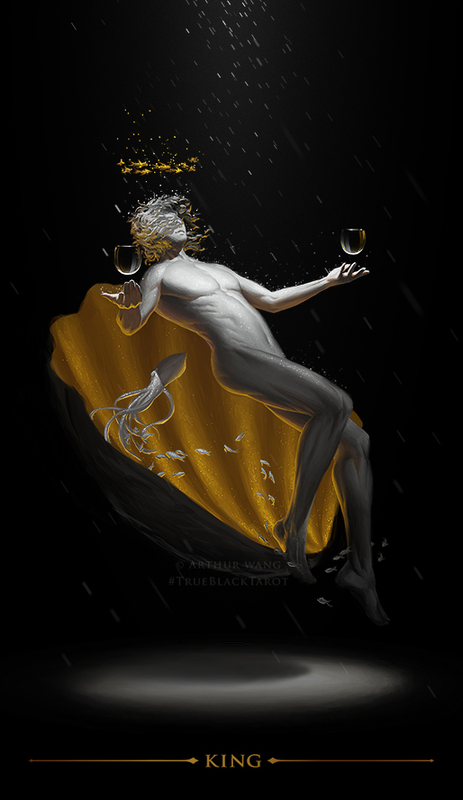 The King of Cups, a fitting partner to his flirty and playful Queen. He represents calm and control in the midst of stormy seas, a reassuring and composed presence in spite of whatever pressures are surrounding the situation. As a level-headed man, this King is also representative of cooperation and equality, portrayed as the octopus, long seen as the predator of nearly all fish, coexists with other marine life in the warm light of his throne. I did a photoshoot for a good amount of painting reference this past weekend, so I'm hoping to hammer out a good 4 or 5 paintings over Christmas break! The artwork is so rich, lush, and effing gorgeous! I'm always a little hesitant when talented artists with minimal tarot background attempt a deck -- but these are looking seriously solid, and your background in product design shines in these cards. They're much more polished than most indie decks. I'll be consulting with a professional reader to make sure that the symbolism and content is correct. Awesome! We appreciate the extra work you're taking to make sure the deck is readable and not just pretty. These look amazing so far -- I look forward to seeing more! It's looking like a must-have deck for me. I understand that having an outsider interpret something that's so integral and core to your life is a bit hard to be totally comfortable with, but I assure you that I'm not just here to paint pretty pictures. I've had a long history of interest in mythology, the occult, and psychology/anthropology, so the symbols and stories that I find in tarot is really what drew me to it in the first place. I'm certainly going to try my best to represent these cards as holistically and faithfully as possible! With that said (and you probably have noticed already), I do have a tendency to put a dark spin on a few things. I just wanted to say that these cards are absolutely gorgeous! I have always wanted a deck like this (the style and almost dreamlike, otherworldly quality) and am so excited to see this being brought to life. I love how the art on the cards seems to be floating, but completely still at the same time (hard to put into words). PS- Can't wait to see what you do with the Moon card. One of my favorites! These cards are absolutely gorgeous! (I might be repeating what has already been said - I imagine that this imperative has already been used in some of the above posts). The images are delicate and strong at the same time! I am going to follow too the progress of this germ, hoping to hold a copy in my hand sometime in the future. Good luck with your project. It's wonderful!